On the third anniversary of the Great Eastern Japan earthquake, Zapuni LLC are proud to release ‘By Your Side’ an animated music video two years in the making, set to Sade’s Grammy-nominated song. 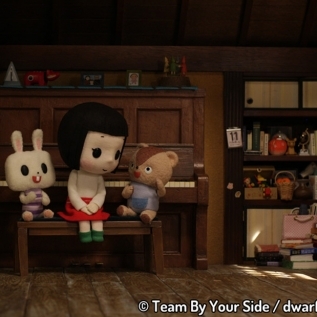 This powerful and beautiful film is directed by Tsuneo Goda and the award-winning stop motion animation company dwarf, who are responsible for the hit TV series ‘Domo-kun’ and ‘Komaneko.’ You can view the animated music video for ‘By Your Side’ now at https://vimeo.com/zapuni/byyourside. After the devastating impact of the 2011 Great Eastern Japan earthquake, a global effort to bring aid and assistance was initiated to help the people of the Tohoku region reconstruct their lives. But sadly, many of the most vulnerable are still in great need of help — especially the children, many of whom have been emotionally and psychologically traumatized by the tsunami and Fukushima nuclear disaster. Filmmaker and artist Gregory Rood, inspired by the work of El Sistema, a visionary global movement that transforms the lives of children through the healing power of music, decided to bring together some of Japan’s most talented anime artists with globally renowned songwriters and musicians. Their collaborative original short films help raise both awareness and funds for the children of Tohoku. Donations are used to provide them with instruments and a musical education. To transform his idea into a reality, Rood worked with friends Seiji Nagai (artist & entrepreneur), Vincent Shortino (Executive Vice President, Crunchyroll Inc.) to create Zapuni LLC. In 2013, Zapuni released two films: ‘Psychedelic Afternoon,’ with music by Ryuichi Sakamoto, lyrics by David Byrne and animation by UrumaDelvi, and ‘Blossom,’ with animation by Yutaka Yamamoto/Ordet set to ‘Hoppípolla’ by Sigur Rós. For Tsuneo Goda and the team at Dwarf, it is very important that we never forget the nuclear disaster at Fukushima, and the continued suffering of the children in Tohoku. Sade donated the song ‘By Your Side’ because “it expresses a feeling of love and solidarity with the children in the Tohoku region in their time of need.” This film is a gift of love and support to the adults and children whose lives have been changed forever by the disaster. Please give generously to the children of Soma, Fukushima through Global Giving or in the US donate $10 instantly by simply texting “give 14117” to 80088.